All the benefits of the Concreter wheelbarrow, but with a puncture-proof wheel. This wheelbarrow has been purposefully designed for full time service in construction, specialising in transporting and placing concrete. Pourer to assist with concrete placement. Black plastic, reinforced under the tray and the pourer. Bolt-free design, to give a smooth tray. Impact resistance factor of 15. Rigid, galvanised, legs and bracing for strength. This is a robust chunky tyre, eliminating all punctures from tie wire and sharp rebar. 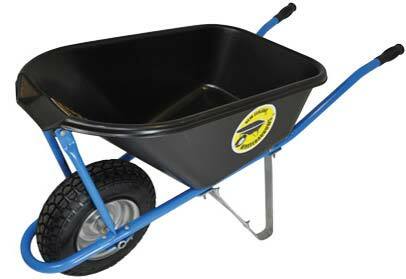 "I have done a great service for concrete placers to bring you this connoisseurs wheelbarrow for a really good price. Use and enjoy this rugged precision wheelbarrow. You will appreciate it as much as I do!"